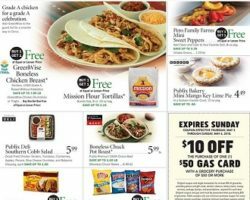 Publix Weekly Ad Circulars. Get This Week Publix Ad, BOGO sale prices, grocery savings, sale specials, digital coupons, and offers. Publix Sale Ad Preview Deals. Most Publix locations have a Pharmacy staffed with caring professionals. Save with Publix BOGO Sales, and every week check the Grocery Ad and find great offers for food and groceries. Get Publix or Retail Gift Cards. Select any amount from $5 to $500 per card and get Free standard shipping. Departments and Services: Bakery, Deli, Meat, Seafood, Produce, Grocery, Dairy, Beauty Products, Housewares, Money Order Sales, Money Transfers, Check Cashing, Coin Counting, ATM, Sushi, GreenWise, Western Union. The grocery retailer was founded in 1930 in Winter Haven, Florida, by George W. Jenkins, and now is the largest employee-owned grocery chain in the United States. The revenue reached $32.4 billion in 2015, with over 1100 stores. Publix has supermarket locations in: Florida, Georgia, Alabama, South Carolina, Tennessee, and North Carolina.